8oz Glass Bottle - 6 bottle set: Dad, Grad, Hero, Mom, Soulmate, and Superstar. You can also MAKE YOUR OWN, and buy them on-line at buy.shareacoke.com/ They are $5 each, and $5 shipping - but free shipping if you order more then 6. 8oz Alum. Bottles - Again, not sure how many will be released, but some are suppose to be released. 2 Liters - I think also will have some special labeling. 1.5 Liter - I think I seen that also saying there would be special labeling. 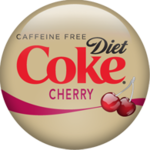 Coke Freestyle - 3 new exclusive mixes, PLUS 1 SPECIAL SECRETE MIX - You have to download an app to your phone, and then link up your phone and Coke Freestyle Fountain machine to have access to the secrete mix. If anyone has found different words, please post about them. I'm starting to get my checklist together to get all the cans, and probable the alum. bottles also. As I find more, I'm just updating the list in the original post - I've found 10 different Coke Zero cans so far, along with 1 more that is pictured on the box, but haven't found that can yet. Thanks for doing all the work macoan! Where'd you find all these? I'm not seeing them anywhere yet! 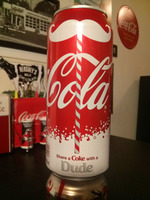 Oh they will be everywhere soon - Coca-Cola is just getting started! Updated the list with all 12 Coke Zero's names (I now have at least 1 of each of those cans), plus updated the 7.5oz can list - know of 6 different cans for Coke & Diet Coke - only 5 for Coke Zero, but guess there are 6 of those cans available also. .... and just updated with the 6 names on the 8oz Glass Bottles. The USA 2015 54 Can Set + 6 8oz Glass Bottles. Has anyone seen the alum. bottles with words on it? I thought I read somewhere there were going to be some, but haven't seen any yet. Not too shabby! I'm about 20% there. I personally haven't seen any alum bottles with anything yet. For the 12oz cans, my sets are a mix of "no ad", and "Six Flags Great America Ad" on the cans. I don't drink diet & zero, so I hate buying more just to dump and waste - at least the Coke I will chill, bottom open, and pour in a glass so I enjoy the soda. Just when you think you're done! I've found 4 aluminum bottles for regular coke. 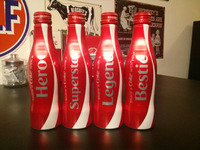 (Hero, Superstar, Legend, Bestie) I found them at 2 sources and those are the only ones I've found so far. And a pretty cool tall can. Share with a Dude on one side and Diva on the other. There are 6 of the 8oz Alum. bottles, I ended up finding all 6. 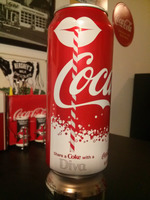 Haven't seen the Dude/Diva big can yet.